Industrial training is around the corner and students have started searching for the best centers all around. Six months industrial training plays an important role in the students lives. This decision should not be hurried as during this time student gets an opportunity to prepare themselves for the future career. Today in this article, we bought guidance for the java students for their Industrial training in Jaipur. What is Java industrial training? In simple words, it is a six months project based on java training. In this pedagogy, java students enhance and apply their skills practically on the live projects. It is a process to turn them as a proficient Java developers. During this time period, they can acquire the learning skill and sort out their queries. 1) Grab the experience: By opting for the training you prepare yourselves for the professional environment. The experience helps you to deal with the future job. It enhances your skills in many ways and helps you to remove the tag of fresher. 2) Live project: Industrial training offers you an opportunity to work on the live project and enhance your skills. The live experience is more worth than the theoretical part. Java training helps to have an exposure in the practical field. 3) Build contacts: It helps to enlarge the network and improve the connections with each other. 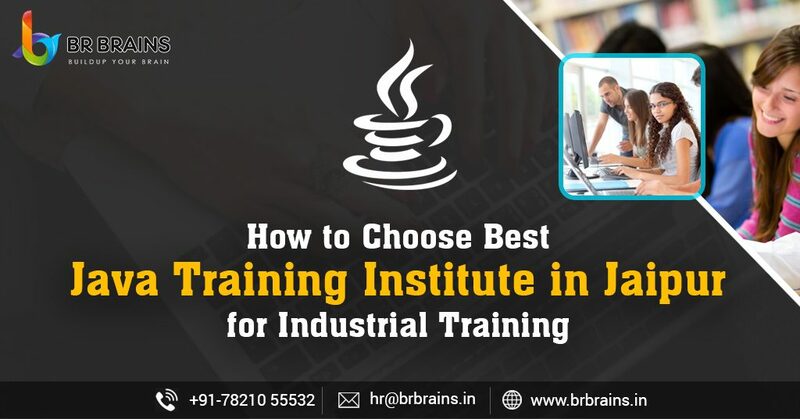 Java industrial training helps you to make your space in the industrial field and give you a chance to meet with experts and who are the part of the industry. 4) Boost Resume: Industry demands experience, the mention of java industrial training in the resume, the recruiter mind is set that you have a practical knowledge. Over there the preference of selection of your resume increases. 1) Evaluate yourself: It is essential to know that where you are, judge your skills and strong points. To know where you are lacking is really essential for the students. On that basis they can choose the center according to their preference as java is wide field. 3) Interact with faculty: Faculty is the vital part of your training session, so have an interaction with them. Have a small session with them as it will help you to understand their teaching style. The faculty is the best way to judge the institute, the best institute will hire professional and certified teachers. By their communicating style, you can get a glimpse of their professionalism and dedication. 4) Evaluate the course curriculum: View the course curriculum, and know about the updated syllabus. Find out that the syllabus is updated or not, it will help you to the institute is working actively or not. The best institute will make you a fully fledged java developer will prepare you in depth and teach you from the basic and will take your inner interest among you. 5) Infrastructure of the institute: Have a look at the Infrastructure and other facility of the institute. A top rated training institute in Jaipur will offer you a high end access of technologies. Along with this, a proper learning environment. But while observing the infrastructure don’t avoid other factors. Sometimes students take their decision while seeing the ambiance and get influenced. You want to grab the skills. 6) Overview the placement structure: Many institutes have the tie ups with the top and reputed IT Companies, which help students to get the placement. Placement is the first choice of the trainers and if you get the job immediately after training, so the training is fruitful. Have a check on the previous statistics of the placement structure. 7) Review the on digital platform: The modern era is of digital and you will get everything on the platform. To review the institute, check the reviews and testimonials on the site. Even you can get connected to the previous students, who have completed the training from the institute.